Bryggen is the Bergen wharf on the harbor when you visit Bergen. 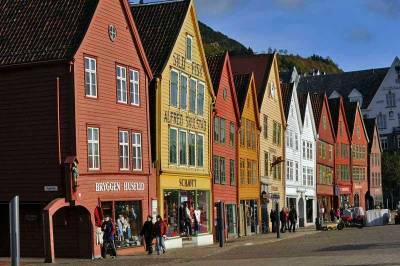 Bryggen is a UNESCO World Heritage site that is famous for its row of historic wooden buildings along the wharf. The 18th century Hanseatisk Museum building on the Bryggen wharf is typical of the historic buildings . The Bryggens Museum is a block from the wharf. St Mary’s Church is a 12th century Romanesque style church near the waterfront. At the inner end of the harbor are the Fish Market and the flower & vegetable market. The Ludvig Holberg statue faces the harbor. In summer, take a harbor cruise on the M/S White Lady sailing ship, which departs from the Fish Market. Walk a couple blocks inland from the harbor and catch the Fløibanen Funicular for an 8 minute funicular ride up Mount Fløien. Enjoy views over the city of Bergen and dine at the Fløien Folkerestaurant. 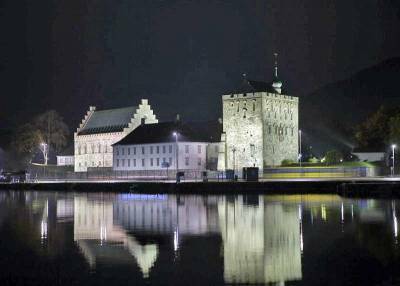 Bergenhus Fortress was built in the 13th century to guard the entrance to the harbor and Bryggen wharf. The fortress is right beside the cruise ship terminal. 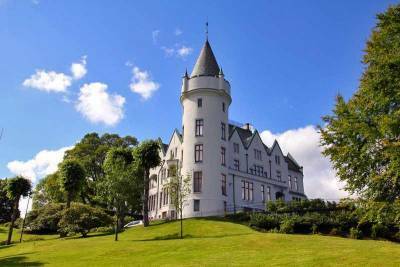 Bergenhus Fortres includes the Rosenkrantz Tower and the royal residence of Hakon’s Hall. The pedestrian only area at Torgallmenningen Square starts right at the inner harbor and continues south through the Old Town. 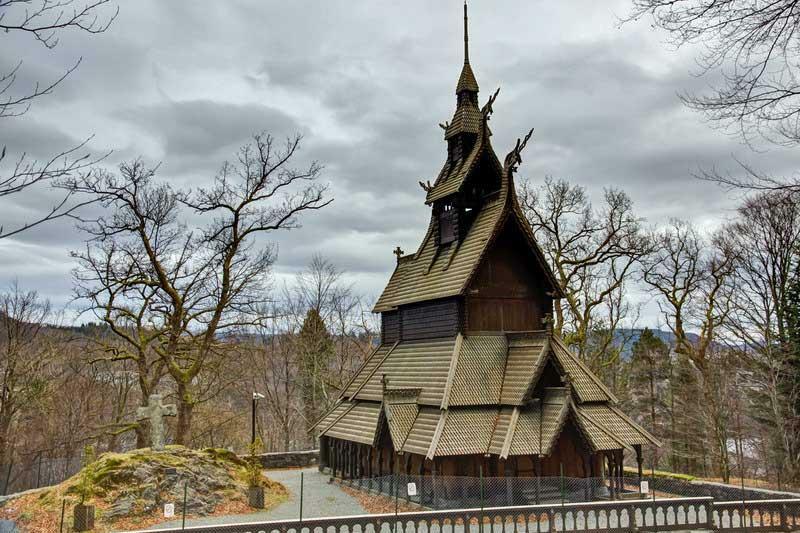 Other sights to see in the Old Town include the Bergen Cathedral, the Bergen Kunst Hall of contemporary art and St John’s Church. The Bergen Aquarium is at the tip of the southern peninsula that marks the harbor entrance. 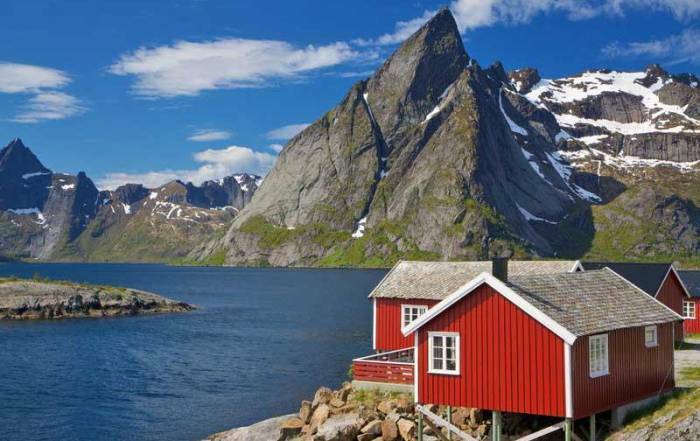 Norway in a Nutshell is a popular day trip from Bergen. You start in Bergen on the Bergen Line Railway and ride to Myrdal. From Myrdal you ride the Flam Railway down to the town of Flam on the Aurlandsfjord, which is a bay on the larger Sognefjord. The Flam Railway stops on the way down to let passengers out for a few minutes at the Kjosfossen Waterfall. In Flåm, the next part of Norway in a Nutshell involves a fjord cruise through Aurlandsfjord and Nærøyfjord to the small town of Gudvangen. After the fjord cruise, you take a bus up out of the fjord to the town of Voss. At Voss you finish off your Norway in a Nutshell tour by taking the Bergen Line Railway back to Bergen. For those who prefer a longer fjord cruise, take a 5.5 hour one way Sognefjord cruise directly between Bergen and Flåm. Catch a bus to Ulriken from the Fish Market. Then ride the gondola to Mount Ulriken for the city views and a meal at the Sky:Skraperen Restaurant. Enjoy an intimate concert at the Edvard Grieg House/Museum and the waterfront cottage where the famous Norwegian composed. Stop on the way there to see Gamlehaugen Royal Castle and the Fantoft Stavkirke Stave Church. 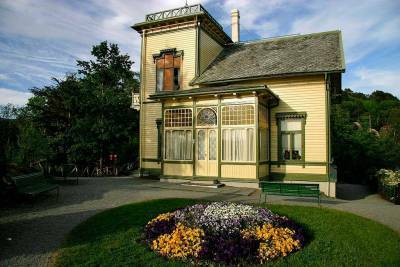 Old Bergen Museum – a reconstruction of about 50 buildings in an open-air museum. Travel 3 hours to the Vøringsfossen Waterfall, possibly the most photographed waterfall in Norway. 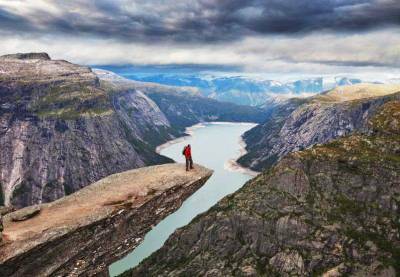 Travel 3 hours to Skjeggedal, and then hike 12 hours up to the Troll’s Tongue. The Troll’s Tongue is popular with adventure hikers who enjoy standing on the rock “tongue” that suspends over 2,000 feet above the lake below. Bergen Airport – Flesland (BGO) is the way to get to Bergen by air. 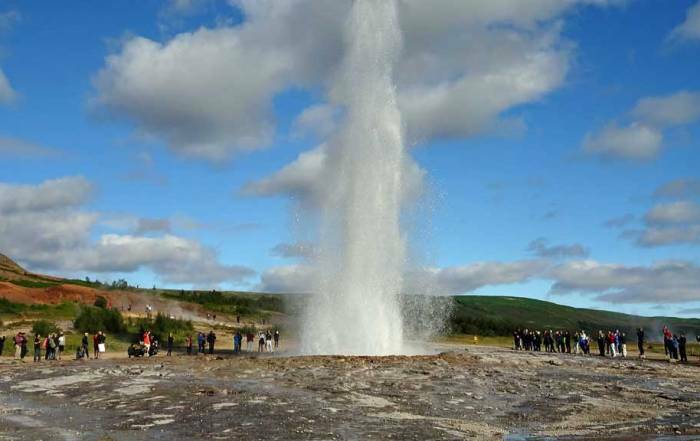 The airport is in Flesland, which is about 20 minutes from downtown by cab or 40 minutes by bus. Bergen Light Rail started operating in 2017 between the Bergen Airport and downtown. Bergen Rail Station, in the downtown, has regular connections on Norwegian State Railways to Oslo, which takes over 7 hours. From Bergen Station it’s about a 10 minute walk to the inner harbor. Bergen also has an excellent selection of buses, trolleys and trams operated by Skyss. The cruise ship terminal is at the beginning of the old harbor beside Rozenkranzt Tower and Hakon’s Hall. You can walk to Bryggen wharf from the cruise ship terminal in about 10 minutes. Passenger ferries run from Bergen south to Hirtshals, Denmark on the Fjord Line and north to Sognefjord and Nordfjord. 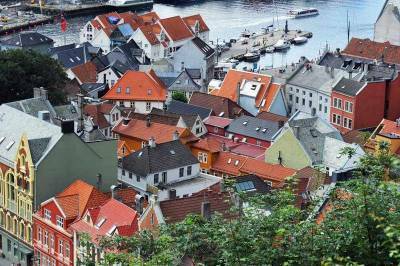 You can also take a ferry to Flam or Stavanger. Bergen is also serviced by the Hurtigurten Ferry, which visits all the coastal communities to the north. The Hurtigurten Ferry route also goes around the northern tip of Norway to a point beyond the Arctic Circle near the Russian border and . Bergen weather is influenced by the North Sea and the city’s northern latitude. The height of summer is July and August, when average highs of 65 F (19 C) can be expected, while average lows are 52 F (11 C). From December – February, average high temperatures are 40 F (5 C) and average lows are around the freezing point. 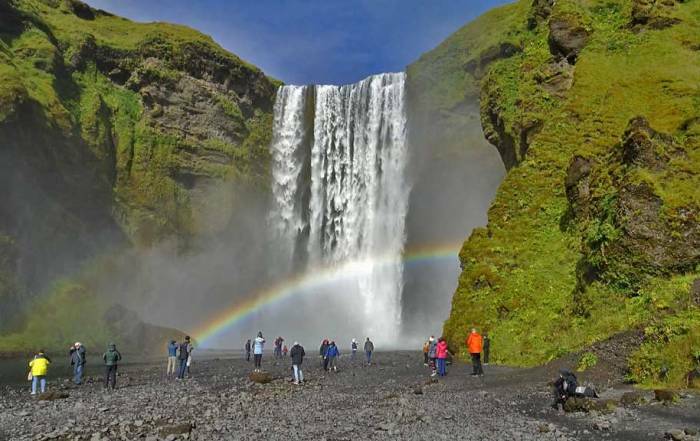 The summer months are the most popular for tourism. 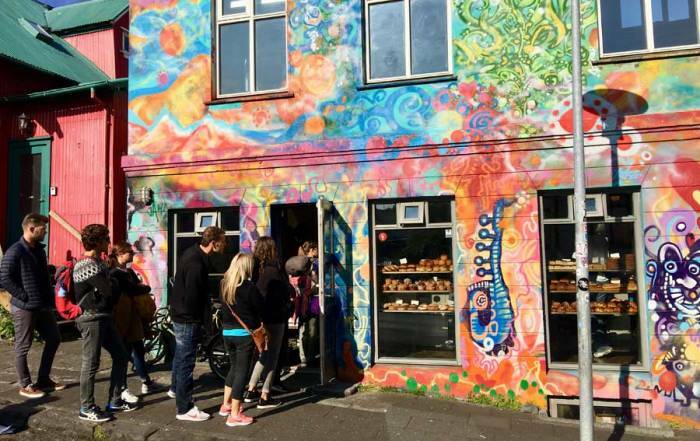 June can be an excellent choice for the best time of year to visit Bergen. Bergen is the Gateway to the Fjords of Norway. The city of Bergen in in Western Norway on Vagen Bay. Bergen is the second largest city in Norway. 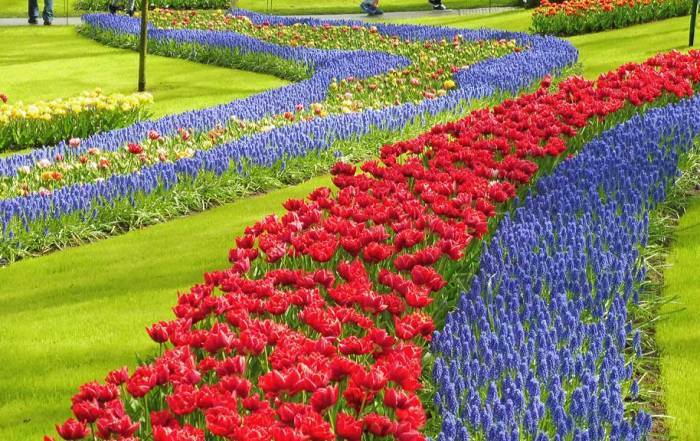 About 400,000 people live there. The city is set among 7 mountains, with the highest being Mount Ulriken. 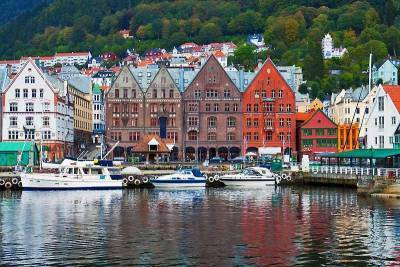 Bergen was incorporated in 1070 and was a member of the Hanseatic League in the 1200s. At that time, haddock fishing drove its economy. 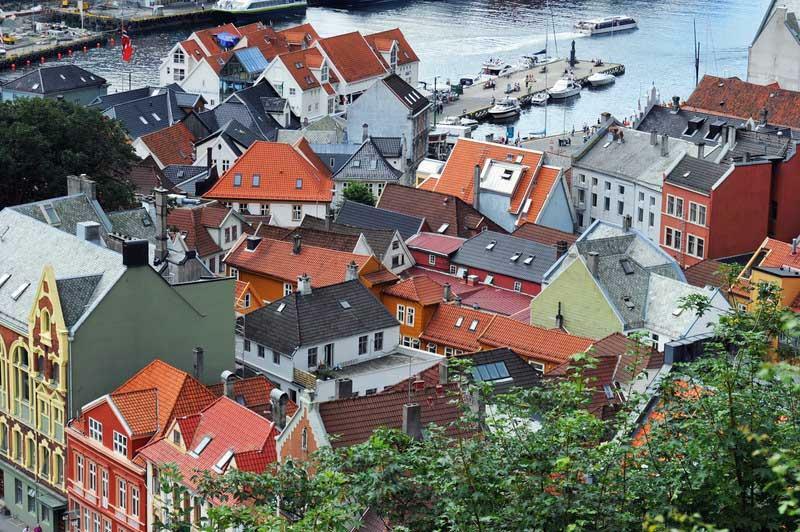 The harbor area, called Bryggen, is a World Heritage site. Bergen suffered from many fires over the years, typical of many cities in Europe without access to stone building materials. The locals speak a dialect of Norwegian called Bergensk.